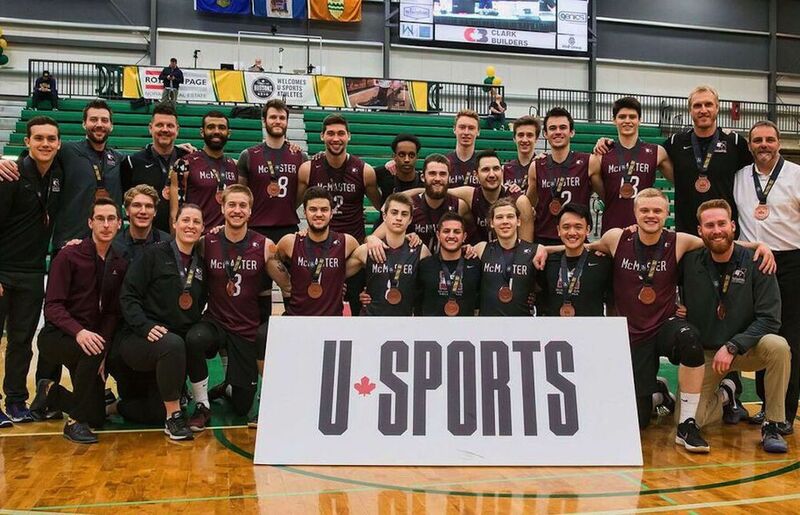 EDMONTON (U SPORTS) – With their trademark block-defence at its dominant best, McMaster shut down UBC to claim the bronze medal at the 2017 U SPORTS FOG Men’s Volleyball Championship, Sunday afternoon at the Saville Community Sports Centre. With a 3-0 win over the Canada West bronze medalists (25-14, 27-25, 25-17), McMaster leaves nationals with a medal for the fifth-straight season. “Not exactly the colours we wanted, but we’re very proud of what we accomplished so far,” said McMaster’s U SPORTS First Team All-Canadian Danny Demyanenko, who finishes his university career with two silvers and three bronze medals from U SPORTS Championships. Demyanenko factored into Sunday’s win a big way as the captain led McMaster’s incredible block defence to nine total blocks and numerous chips that ruined sure kills for the Thunderbirds. “Our block defence was incredible because our serving allowed it to be,” said McMaster head coach Dave Preston. “Last night, we didn’t serve well enough for our block defence to be good. That’s been our mainstay all year. We love to defend. “Tonight our serve allowed us to do that. 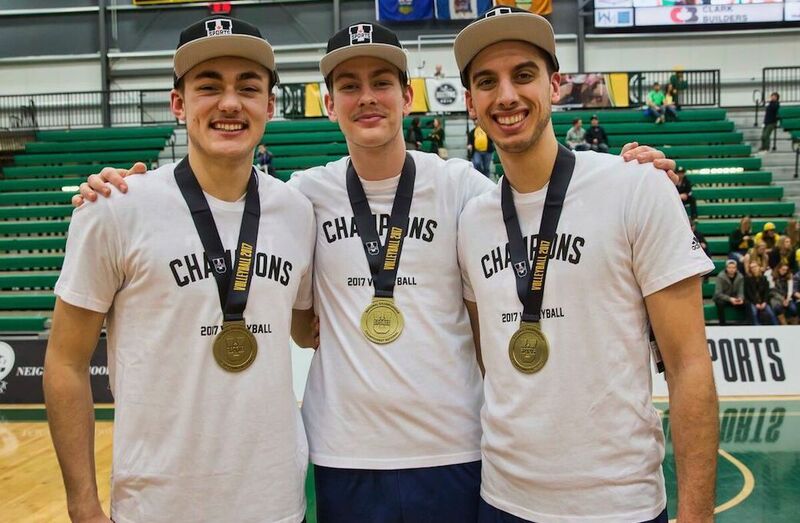 Last night it didn’t,” he added of a four-set defeat to Trinity Western, the very team that beat them in the national final a year ago. The Marauders were game right from the first serve, cruising into the technical timeout up 16-7off Demyanenko’s ace. They just kept extending their lead from there, ending it when Brandon Koppers blasted one of the UBC block and out. It was not the same Thunderbirds team that took host Alberta to the limit on Saturday night. “It took us a bit of time last night to regroup and release that loss last night,” UBC head coach Kerry MacDonald acknowledged. “That was a tough one. I thought we had the momentum going into that fifth set and to lose that one was tough. But today, we were really playing for a bronze medal because I thought our guys deserved it with what they did this year. In the second set, UBC was undone by serving errors – recording six of their 12 in that span – as McMaster held an early lead. However, the Thunderbirds deserved a better fate in the set. They were up 22-19 and seemed poised to make it a long match. But McMaster came out of a timeout fired up, closed the gap and a close set ended when UBC middle Joel Regehr went long on back-to-back kill attempts. “There was kind of a combination of issues today,” said MacDonald. “I don’t think we served overly well. And we made too many attacking errors. We actually passed the ball quite well, but we never really got our offence going at all today. Hitting errors (10 total) destroyed any momentum UBC had going in the third set as they recorded a team percentage of -.062, unable to mount any offence against high-leaping McMaster. The match ended when Thunderbirds’ junior national team setter Byron Keturakis put a kill attempt into the net off a scrambly play. Captain Irvan Brar, powerful and fantastic at times in the match, led UBC with 13 kills. Keturakis chipped in 31 assists and six digs, but he was off his normally dominant serving game with four errors. Cam Fennema added eight kills and an ace for the Thunderbirds. McMaster was led by Koppers’ 10 kills, while Andrew Richards, Demyanenko and Jayson McCarthy had eight each. Andrew Kocur added two aces and six digs.